They say men who buy big guns are compensating for something. What does that mean about the man who bought this one? Let's start off the answer to yesterdays Made Up Monday™. I lied. You do not produce 1 pound of ear wax in your lifetime. You actually produce 3. And now, on to todays post. That gun up there is small. The coin next to it for size reference is an English £1 coin. So, that's a small gun. It was built by one of the finest gunmakers in the world, James Purdey. Purdey guns are all handcrafted, and take at least 18 months to produce. They also start at $20,ooo. I've seen Purdey shotguns selling for $250,000 or more. Generally, they are made for a specific shooter. Much like you'd go to a tailor for a custom suit, if you go to Purdey to buy a gun, expect to spend about a half day getting measured for your gun. 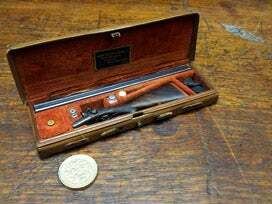 Purdey makes an exquisite gun. A lot of your high end gun manufacturers do this, though. And, Purdey isn't the most expensive gun out there. But they are among the highest quality. The shotgun I'm talking about today though, is the one pictured above. Fully assembled, it will fit in the palm of a mans hand. It was built for, and presented to King George V in 1935 for his Silver Jubilee. It's an exact 1/6th scale replica of the Purdey shotguns the King already owned. It was built by Harry Lawrence, and he actually built three of them. The barrels are only 3.5 inches long. And, it took him about three years to make them. They are numbered 25,000 to 25,002. Seeing as how Purdey began making guns in 1814, you can see they weren't mass produced by any means. But, the thing that makes this gun so amazing is, it works. It's a fully functional double barrel shotgun. Working with ammunition maker Eley-Knoch, special cartridges were made for the guns. They contained 1.62 grains of powder, and 2.02 grains of dust-shot. (typical shotgun shells have 75.2 grains of powder and 525 grains of shot pellets). They were just under a half inch long, and were live ammunition. When fired, the gun was operated exactly like a full sized gun. And when opened, the cartridges were ejected, just like a full size gun. King George was said to have actually used the guns, as well. He liked to use them to shoot moths. Try as I might, I can't find any evidence as to whether or not he hit any. Today, The gun, in it's case, and still fully functional, along with a full box of cartridges, sit in the Royal Gun Room at Sandringham House, which is the traditional country retreat of the royalty.